Today's Events: IGWG discussions on access to justice, jurisdiction, international cooperation, and implementation mechanisms. The Corporate Accountability Working Group of ESCR-Net (CAWG) participated in the fourth day of discussions towards the proposed treaty. Statements from states and other participants followed on from yesterday’s panel discussion on access to justice, effective remedies and guarantees of non-repetition. Civil society groups repeatedly stressed the importance of ensuring those affected are central to this discussion, and that access to justice is an indispensable part of the treaty. The discussion was followed by a panel on jurisdiction during which the need for the elimination of the forum non conveniens principle was stressed and participants explored the issue of extraterritorial jurisdiction. On the topic of international cooperation, participants recognized the importance of developing practical measures to ensure a global response to addressing transnational activity and existing impunity for many corporate human rights abuses. CAWG’s midday side event focused on corporate capture – the undue influence of corporations on government decision-making. 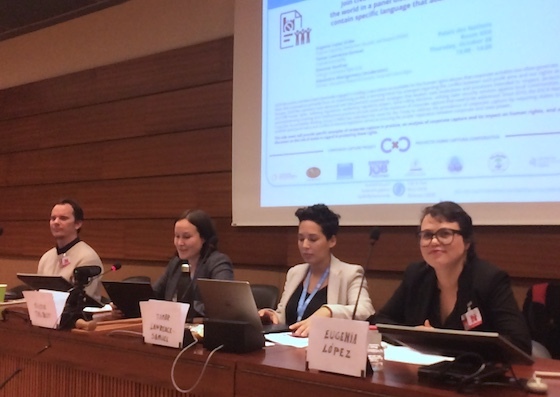 CAWG members PODER, Center for Constitutional Rights, and Corporate Accountability elaborated on the meaning and manifestations of corporate capture, how states might address such practices through the treaty, and drew lessons from the Framework Convention on Tobacco Control negotiations. On the afternoon panel on mechanisms for promotion, implementation and monitoring, participants expressed differing views on the appropriate way to ensure implementation of the treaty – whether through national action (including engagement by NHRIs), the use of existing mechanisms, or a new body such as an international court. IG WG program of work: General Provisions and a panel on ‘The voices of the victims’.